I’m Lydia and I used to write a blog called London Makeup Girl. Work and life has gotten in the way of regular blogging for me (I hear you – CH), but Caroline has kindly invited me to guest post on her turf about my favourite natural* skincare products. or a variety of organic produce. In either case, you’ll likely be healthier than if you lived on nothing but junk food. A combination of the two is often no bad thing. that’s enough about me and my tao of skincare. 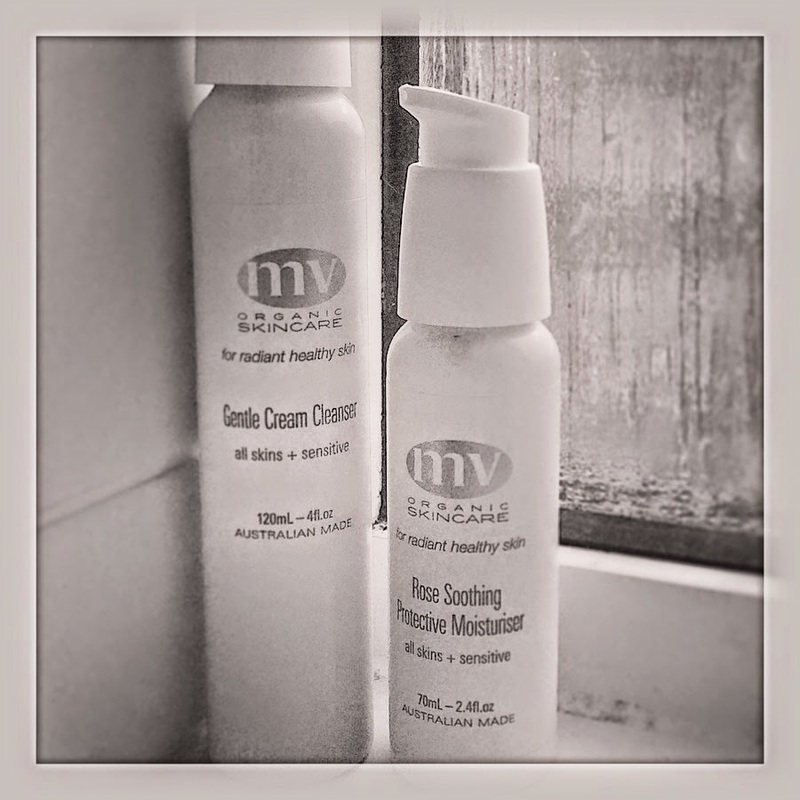 The products I’m reviewing today are from MV Organic Skincare. The Gentle Cream Cleanser is a thick cream cleanser – a bit thicker than a cold cream, and definitely more cream than lotion. I use one or two pumps on dry skin, but then I wet my fingertips to massage the cleanser over my skin as per the instructions. This makes it much easier to spread; if you don’t use damp fingers you’ll either drag the skin or need to use (and waste) a load of cleanser. It has a gentle citrus scent (from the mandarin essential oil). I remove with a wet flannel, and then splash with cold water. This cleanser takes off eye makeup efficiently (I don’t wear waterproof mascara, but it can remove a Bobbi Brown Gel eyeliner with no problems). correct amount. It’s also very good mixed with a couple of drops of facial treatment oil for drier skin; the MV Organic Booster oils work well, so does Sunday Riley Juno (review on that coming soon) and the De Mamiel Seasonal Oils. These are good, simple products; they are very easy and no-fuss to use, and are particularly good on inherently sensitive skin or skin that has been riled up by a change of climate or harsh skincare. I also like that you can purchase 15ml travel/trial sizes before you invest in full sizes. I purchased mine from www.beingcontent.com (most of my skincare comes from Content). There’s more information on the MV Organic website at www.mvskincare.com. that is natural is good for you. Previous Post Erm. WHERE have you BEEN/where have you GONE?